Welcome to CFO.University’s Transcript of Andrew Lee’s CFO Ed Talk™, System Implementations Can Be Successful. Some of America’s best run companies fail when implementing an ERP system. 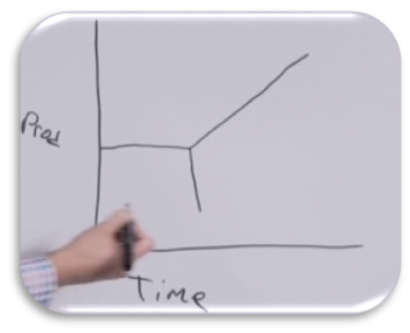 Andrew describes how three simple concepts; lead, limit and organize can make your system implementation a success. ​To this day, eight years later, I remember pulling into my driveway on a Friday evening a little later than normal, turning the car off and laying my head down on the steering wheel. Three days earlier we had launched our new ERP system and it was not going well. ​So, I used the rest of the weekend to reprioritize the project plan and work on a couple open issues. By the end of the weekend I’d convinced myself maybe things weren’t so bad. That maybe as the project owner I had taken on a little more stress than the rest of the company. ​Monday morning, I came into the office; the first person I see is sitting at her desk crying. She didn’t know how to use the system; the system was not working; she couldn’t do her job. According to the research firm, Gartner, seventy-four percent of ERP system implementations are considered failures. ​According to that same firm, ninety percent of future implementations through 2018 will fail. Why? What are we doing wrong? Google ERP implementations and you’ll find stories about some of America’s best run companies and their implementation failures. CFO’s get fired for these things. Shouldn’t we figure it out? ​Since that time, I had the opportunity to do another implementation. It wasn’t perfect but the results were like night and day. Within three months, our efficiency was better than before we launched. Within one month, our accuracy was better. Our team had the tools they needed to stay in better contact with customers, sell more, run a more robust website and a more efficient operation. Most importantly the team loves it. So, what changed? What did I learn the second time around? What I want to share with you today are some simple but powerful concepts based on the following; lead, limit, organize. Do this and you’ll run an effective implementation and avoid getting fired. 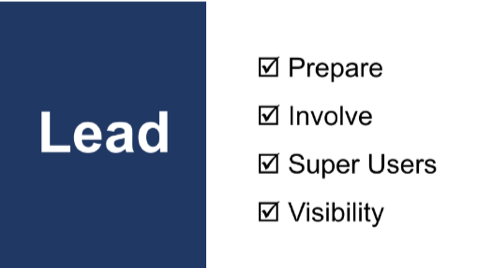 ​Lead = Prepare, Involve, Super Users, Visibility. ​First is to prepare. Prepare the team. Change scares people. Most people don’t like it. What’s even worse is the unknown and you have both of these factors during an implementation so it’s no wonder that people have emotional breakdowns. Talk to them, help them see what’s coming and share the project plan with everyone. ​Your team needs to see the light at the end of the tunnel. They need to be excited about the project. If you can do this well, their jobs are going to be easier. They’ll be able to sell more and make fewer mistakes with less manual entry. You will want them to see that because; that’s the light at the end of the tunnel. You also want them to be prepared for problems. ​People are likely very excited about launching the new system. The promise of better, quicker more insightful tools can cloud the present. They often look past the time and effort still left to reach those goals They may be expecting productivity is going to immediately increase at launch. 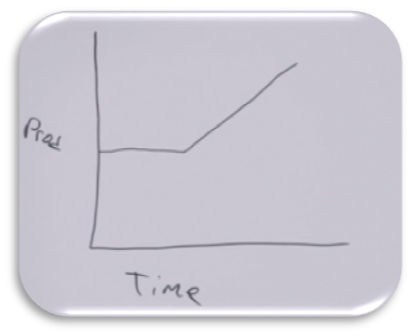 ​What actually happens, unfortunately, is that when you launch productivity goes down before going up above pre-launch levels. It is really important that the team is prepared for and aware that there will be problems so when those problems come up they don’t think the world is ending and that it’s a complete failure. Productivity will recover and exceed past levels. Also show them that you will get back to where you were and in the longer-term, things will be way better than they ever were before. So, show them these graphs repeatedly throughout the process. ​Next is to involve. It’s the people in your organization that are actually doing the implementation, not you. You just need to lead them. So, the best way to involve people is by involving them from the very beginning. Have them help you make and be a part of the purchasing decision. Have them help you weigh the pros and the cons. ​People don’t need to get their own way all the time they just need to know that their voice is being heard. Involve them and you’ll have their buy-in from the start. ​Next are super users. Super users are a great resource for you. You want as many of them as you can get. Ideally one per department would be great. Doesn’t matter what their rank or their title is, you just want people that are excited about the project and maybe have a little bit of skill in this area. They’re a great resource because you can push open items to them. More importantly, they’ll be able to help get the rest of the organization excited and bought into this project. So, we talk about needing to get buy-in from the top, what we really need is to get buy-in from the bottom and then all the way up. ​Fourth is visibility. Your team needs to see progress. This is going to be a really long and grueling project and remember your team is doing this in addition to their day jobs. So, it can be really difficult on morale when you start to run into problems. Two things that can help are; number one, make sure that all of the open issues are visible and number two, show this graph. 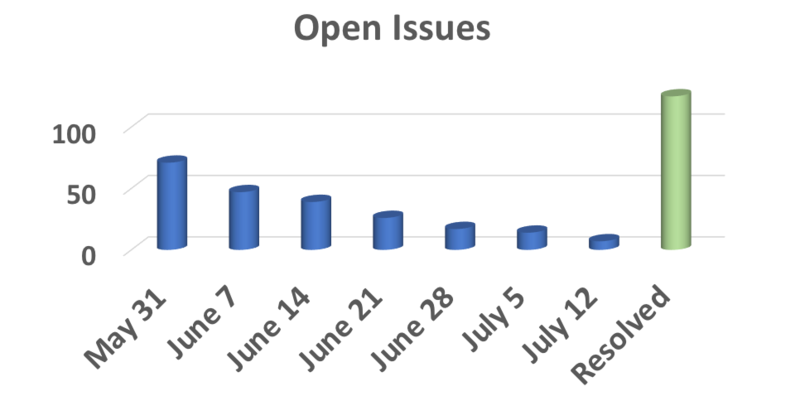 ​The blue bars are the current outstanding open issues by date and the green bar is the cumulative number of issues that have been resolved. It’s really important to see that because even though there’s some really important challenges that need to get figured out, you can also show the team we are figuring things out. You are actually making a lot of really good progress. So we reviewed a chart like this for the company as a whole and then one for each department. Summarizing the first concept, Lead; Prepare your team for change and fall in productivity before real improvement takes place, Involve the people who do the work, develop Super Users from experts who are excited about the project potential and make sure progress is visible to the project team. ​Limit the project using phases. 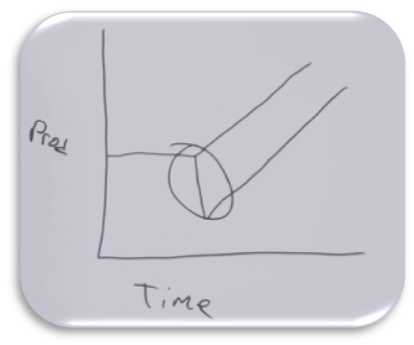 ​What if I told you there’s one mistake you can make that will make you three times more likely to go over-budget and beyond due date. This mistake is tangible. It’s black or white unlike that leadership stuff I just talked about. Customization, modifications and scripting. Avoid them like the plague. Now let me clarify, the reason our team loves our system so much is because we’ve customized it to fit our business needs. We have almost a thousand active scripts running on any given day and we’ve taken several outside modules and implemented them because we like their functionality better than the native functionality. So, understand when I say I’m a big fan of customization; it’s really easy to see what looks like a gap in functionality and want to put a workaround in place for it. You may be right but remember that when you do this you’re taking a system that’s been tested by hundreds of thousands, possibly millions of users and actually creating a brand-new system; a system that you then have to test. And remember that you’re also adding a variable that’s probably going to affect other transactions that you never planned on. ​So, don’t think of the launch as the finish line. Think of the launch as step one. Step one, get the system in place. You’ll have plenty of challenges as it is during the first few weeks. Then after you’ve been operating in that system for a little while you’ll have a much better understanding of what modifications really are necessary and how to prioritize those different modifications. ​Just make sure that when you do that you make that list visible to everyone with due dates and phases so that people can see that those issues are going to be addressed. So, launch now customize later. 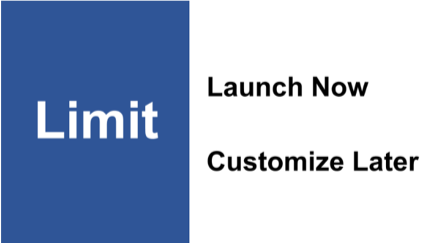 ​Summarizing the second concept, Limit; Don’t think of the launch as the finish line, think of the launch as step one. Step one, get the system in place. place. Once you’ve been operating in that system for a little while you’ll have a much better understanding of what modifications really are necessary. ​Organize the implementation. An ERP system is probably the greatest test in project management. If you can do this; you can manage just about any project. But it is going to be challenging. You have to bring your A-game and it has to be really well organized. So, I recommend using a project management software. 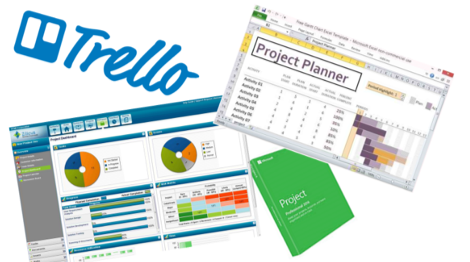 You can use Trello or Microsoft project. You can even use excel. ​The point is, it does need to be really well-organized and using a software can help. Now, a project is just made up of a whole bunch of different tasks or open issues or components; whatever you want to call them. I’ll call them open issues. 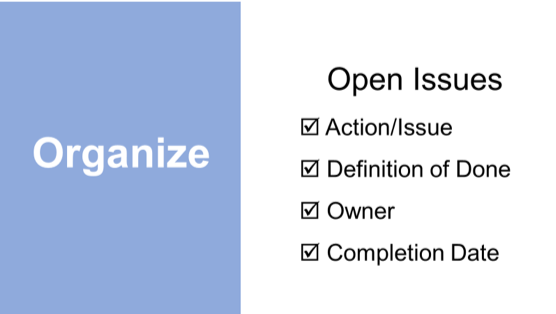 Each open issue, when you set it up needs to have four basic things. ​The first is what is the action or the open issue, the second, is commonly missed but really important, “What is the definition of done?” So, what are all the individual things that need to get completed in order for you to consider it done. Something like documenting the process may seem really mundane; especially, when somebody has 10 other things to do. They’re probably going to miss that one, unless from the outset unless you’ve defined it as something that needs to be finished to meet your definition of done. Third is owner. Have one clear owner, not two or three. One person that’s responsible for getting this issue taken care of. Fourth, what is the completion date? Agree on the completion date with the owner. It’s got to be realistic of course and fit in with the project timeline. These four things are pretty basic. You’re probably aware of them already but you’d be surprised how often they’re not followed. That probably has a lot to do with all of the implementation failures that are out there. What we’re really talking about here is creating an accountability structure. ​Without any one of these four things it’s really difficult to hold anyone accountable. So, that takes us to our final point which is holding the team accountable. When there’s an issue, there will definitely be times when an open issue goes beyond its due date. What do you do when that happens? ​The first time the conversation should be really just about asking questions. What got in your way and what are you going to do differently next time? Also go ahead and reset the completion date. Once it’s in the past it tends to lose a little bit of meaning so go ahead and reset it for the future and get some new urgency behind it. ​The second time an open issue goes beyond its due date; the conversation should probably have a little more intensity. But also remember, that this is a really complex project and there could be factors at play that are outside the control of the owner. ​So, when you have that conversation, be willing to jump in and help. Figure out what the problems and barriers are and see what you can do to take away those barriers. ​Summarizing the third concept, Organize. Use software to help. Create an accountability structure. Hold the team accountable. And don’t just call the team to task but be willing to jump in and help. ​These simple but powerful concepts will assist you in running an effective implementation…. and avoid getting fired. 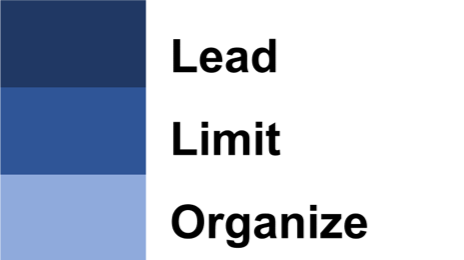 ​Lead, limit, organize. Lead by preparing the team, involving them and giving them visibility into what’s coming. Limit the project by using phases and organize the project by using a project-management software and creating an accountability structure. Hold the team accountable and most importantly be ready to help.